Though sometimes overlooked, bringing the need for disaster preparedness to the attention of the citizens remains a critical responsibility of local emergency management professionals. This task would seem to be particularly challenging in light of the appalling levels of complacency and outright apathy toward the need for preparedness that exists among the public. After years of asking American citizens their views regarding disaster preparedness, Federal Signal Corporation decided it was time to go straight to the source and ask emergency managers across the country about their chief concerns. Just as importantly, Federal Signal’s most recent Annual Public Safety Survey identified both solutions and valuable tools public safety officials are already using to better communicate with their communities. 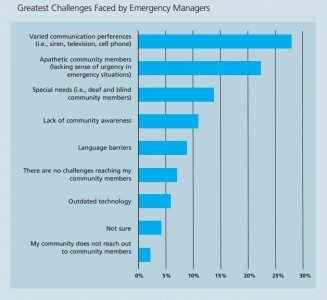 In their own words: The two biggest challenges confronting emergency managers today are too many communication choices and too little concern among the citizenry. Emergency managers now have more ways to reach out and communicate with the public than ever. Unfortunately, and as noted by many emergency managers who were surveyed, this has become as much of a problem as it is a solution. Put simply: It seems you can’t always count on everyone being on the same channel at the same time. According to the study, more than one in four emergency managers pointed to the varied communication choices in widespread use by members of their communities as their most significant challenge. These communication choices range from cell phones and texting to the full spectrum of IP-based communications including email, instant messaging and now, even social media such as Facebook and Twitter. Consequently, it should come as no surprise that emergency managers are increasingly adopting a “layered approach” to their crisis-communication strategies. Additional research strongly supports Federal Signal’s survey findings. With the goal of identifying and analyzing critical factors that influence student responses to on-campus emergencies, researchers from the University of Buffalo’s School of Management targeted communication channels that were most effective in reaching students. They also examined student attitudes toward emergency alerts, such as what students expect from alert notifications, and what factors influenced their compliance with instructions. The University of Buffalo’s research demonstrated that campus alert notifications are the best way for students to find out about an incident and what they should do, and that campuses should use a variety of communication channels to reach students such as text, email and social media. Dr. Raj Sharman, associate professor, stresses that colleges and universities should continually work to improve their reach in these channels. “Once students become accustomed to receiving official notifications through these channels, they are more likely to acknowledge emergency alerts and take action as directed,” explains Sharman. Elaborating, he points out that students’ risk perceptions do not affect their choice of media–either social networking services (SNS) or short message services (SMS)–for receiving emergency notifications. Also worthy of note is the finding that students’ media preferences remained largely consistent across the full range of emergency situations. The study also confirmed that students who are receptive to emergency alerts prefer receiving warnings and notifications via social networking services. Social media not only puts students in contact with other people and information sources they trust, but are capable of offering much richer media options including graphic images and video. Confirming the University of Buffalo researchers’ conclusion that richer media has a positive impact on how people respond to emergency communications, is a similar finding in a National Weather Service (NWS) assessment of the Super Tuesday tornado outbreak of February 2008. Rather than focusing on social media, in this case the recommendation was to encourage television stations to fully develop their capability to display the graphic-intensive NWS polygon warning images that indicate as precisely as possible the region for which the alert applies. In addition to attracting viewer attention with more eye-catching graphics that imparted a much greater sense of urgency, the polygons also provided more precise detail in identifying the geographic areas most in danger. This helped address the commonly cited issue of unnecessary false warnings and alerts. The growing use of social media by official sources responsible for dispersing and disseminating emergency information is clearly a positive trend that goes well beyond simply taking advantage of a communications medium highly popular with younger age groups. By providing users of social media networks with a credible source for accurate information, emergency managers and other public safety officials are able to effectively counter the misinformation and rumors that are common to social media, especially during crisis situations. 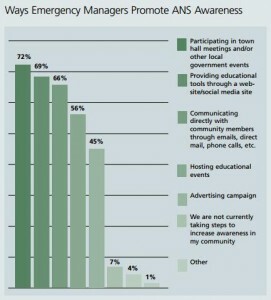 Is public apathy something emergency managers are worried about? As it turns out, yes, the majority of them are very concerned. After dealing with the flood of new communications technology, the next biggest issue cited by the emergency managers focuses on the prevailing apathy and complacency of the public at large. This further confirms findings from previous Federal Signal Public Safety Surveys of individual citizens going back to 2010, but particularly the findings of the 2012 study, which targeted Americans’ attitudes and concerns about emergency preparedness and response. Overwhelmingly but not surprisingly, among the internal barriers to updating emergency communications identified by public safety officials were budgetary considerations. Respondents indicated by a margin of 53 percent that they would currently require additional funding in order to improve communications with community members. To learn more about the effects of apathy and complacency on emergency communications, read Federal Signal’s white paper: Addressing the Issues of Public Complacency and Apathy in Emergency Warning and Mass Notification. Which study is the source for Figure B? These appear to be general obstacles, but who reported them? One of the obstacles is that people tend to forget the importance of being prepared in times of situation like this. They are not really knowledgeable of the benefits it could give them. They should be aware in the first place and that’s the first thing you have to deal with. People should know the importance of helping other people. There might be obstacles in doing so, but they must find ways to it. Good to know that there are really people who are willing to help and no matter what hindrance may come their way, they would still help.